For years we have been asked, “Do you make suits for women?” The answer is, yes we do! With 40 years of experience, we are able to meet all of your needs when it comes to custom-made suits for women. Our options include made to measure suits, custom-tailored suits, and bespoke handcrafted suits. For women, Adriano Carbone is an establishment where you can have a suit handcrafted in house, specially tailored for you. Experience the tailor made difference with thousands of colours and textures to choose from. With Adriano Carbone, you become the designer of your very own tailor made suit. The wait is over, you too can have a bespoke handmade garment. At Adriano Carbone, our bespoke suits for women offer a truly unique experience. When it comes to handcrafted tailored suits, taking over one hundred hours to produce, we can guarantee a product unlike any other. Every piece has its own signature; your signature. 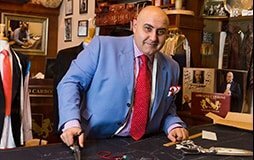 So don’t be intimidated, be the intimidator and experience the difference with a bespoke handmade suit from Adriano Carbone. This Tailored Garment is 30% constructed at First Fitting. This garment requires 3 to 4 fittings. For all those women who would want a garment to truly feel like a second skin, our made to measure suits for women are the perfect addition. You’ll truly feel the difference with our range of fabric choices, styles and more. This Tailored garment is 100% constructed in The Block Arcade Melbourne and requires only one fitting.